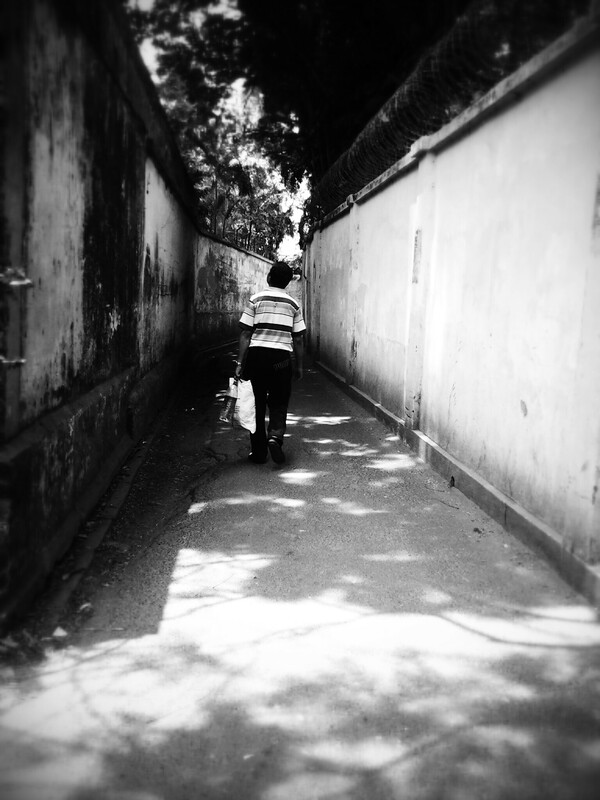 I took this picture in one of the bylanes of Ballygunge in Kolkata. It was a bright and sunny day and these deserted narrow lanes between the houses looked spooky and ethereal. The shadows cast by the trees on either side added depth to this pic. I took this pic with my cell. These little narrow lanes seem to go nowhere but in reality they are the major connecting roads and very common here. In Fact, they define the city. Walking is the only way to go unless you have a cycle or a hand pulled rickshaw which is very common here. The cycle rickshaws can’t pass through these lanes. Also it is very easy to get lost here. I was lucky to have a good guide to guide me through these roads…… else considering the inverted compass in my brain this would have been the perfect maze to get lost in. Wonderful photo! Great atomosphere and perspective! Like the perspective a lot. Nice photo, full of atmosphere.